Social media secrets from those in the know - WorldCity, Inc.
Social media is no longer just a way for friends and family to keep in touch, or for like-minded hobbyists to form communities. It’s now seen as a crucial corporate tool, though not every company has found its social media footing. And it doesn’t function the same in every country. That was the message from three in the trenches: Adriana Grineberg, regional director for Facebook in Latin America; Ismael El-Qudsi, CEO at both social marketing platform SocialPubli.com and its parent, Internet República; and Twitter’s Marco Botero, who leads a team focused on developing media solutions for brands. 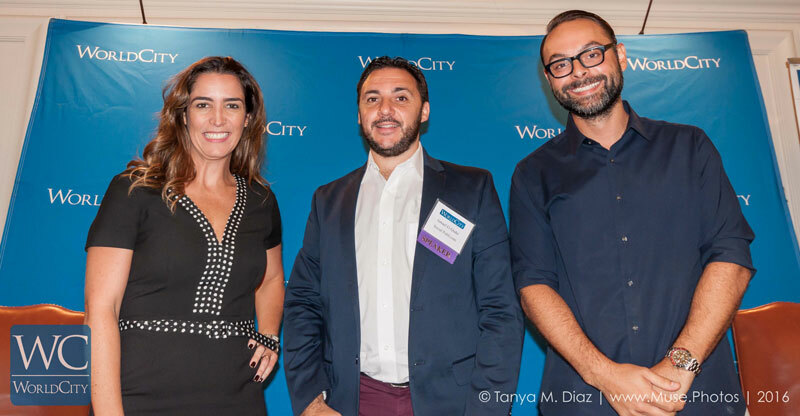 The trio lead a panel discussion titled “Social Media: Strategies that are working,” at WorldCity’s Global Connections event held Sept. 30, 2016, in Coral Gables. Because they all work or have done work in Latin America, the discussion began with a look at the region’s social media culture. 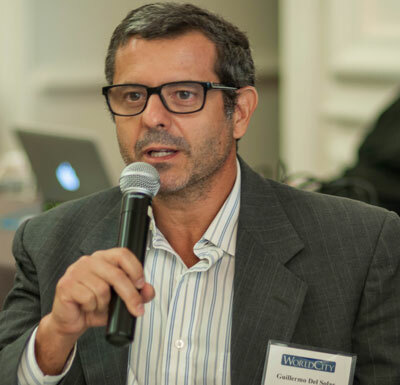 “What is the chief obstacle to social media growth in Latin America?” asked WorldCity CEO Ken Roberts. It was agreed: Tech infrastructure and the cost of access create headwinds. “This is the main issue,” said El-Qudsi. What’s more, he added, companies have to realize that, though Spanish is the common language across most of the region, the culture isn’t monolithic. Users in Mexico and Colombia tend to stay polite in their comments, while discussions are more free-wheeling in Chile, for example. “Twitter has been on an exciting ride in the last year and a half,” said Botero. The company opened both a Miami office and a Mexico office in June, and is moving past its iconic 140-character text format to let users post multimedia content. “Video is driving much of that experience from our users,” he said. Especially popular is live-streaming format, Periscope. Big drivers in Latin America usage include events like the Copa America soccer tournaments, the Brazil-based 2016 summer Olympics, as well as what people are experiencing in Venezuela’s economic crisis. How, asked Martin Enriquez, CEO and co-founder of social media analytics firm Socialmetrix, “do you see brands and social enterprises using social media,” from a research and advertising point of view? “I think it is more apparent at the moment in the U.S.,” Botero said. Brands come to Twitter to build a relationship with consumers. “To put their message in the relevant environment.” He said that every two days, one billion Tweets are generated. Some companies are also using the Direct Message function of Twitter – which can be private – to respond to customer needs that are first expressed through the open platform. Twitter, said El-Qudsi, has become the company for customer support, and Facebook for advertising. Use of Instagram and similar services is increasing, he said, because at the end of the day, people enjoy showing off what they are doing and experiencing. Even so, Grineberg sees something different in Facebook use. “You are there with your friends, your family, the people you like the most.” In fact, she said, the “love” icon is most used in the Facebook icon family. “What are the common mistakes companies make when they are trying to reach stakeholders?” asked Evan Owen, communications and protocol manager for the City of Doral. 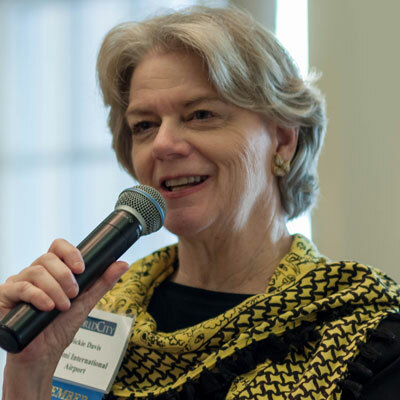 “In terms of keeping up, do you have any general advice on how to stay current?” asked Dickie Davis, director of public and customer relations at Miami International Airport. Botero said his first piece of advice is to take advantage of the free tutorials on Facebook and Twitter and to commit to understanding the platforms. Where, asked Guillermo Del Solar, founder and president, Guillermo Del Solar Consulting, do you see Facebook going in the coming years? “Tech is going to advance, but the heart of the thing is that people like to communicate with each other,” Grineberg said. Still, she said, get ready to get comfortable talking to machines. Advances in robotics means we will all be interacting more with computers. 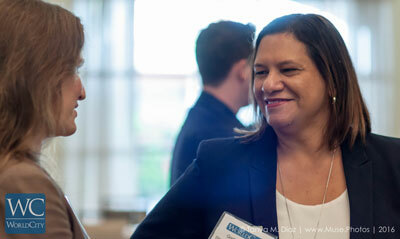 Global Connections is one of four event series organized by WorldCity to bring together executives in greater Miami on international business topics. The Global series is sponsored by the Florida International University’s College of Business and Audicom Productions. 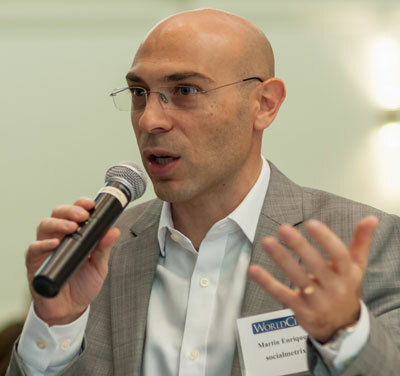 The next Global Connections, “Latin America & e-Commerce: Innovations Galore,” is set for Oct. 21.